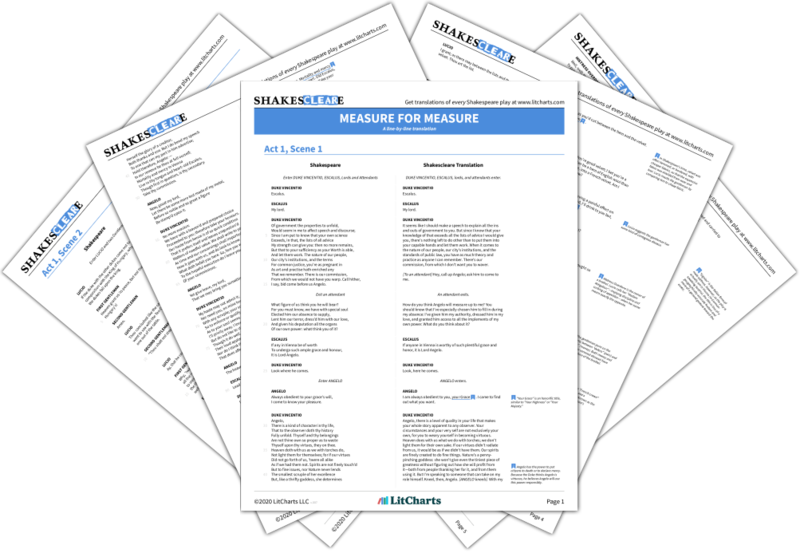 Instant downloads of all 942 LitChart PDFs (including Measure for Measure). New! Understand every line of Measure for Measure. Read our modern English translation of this scene. 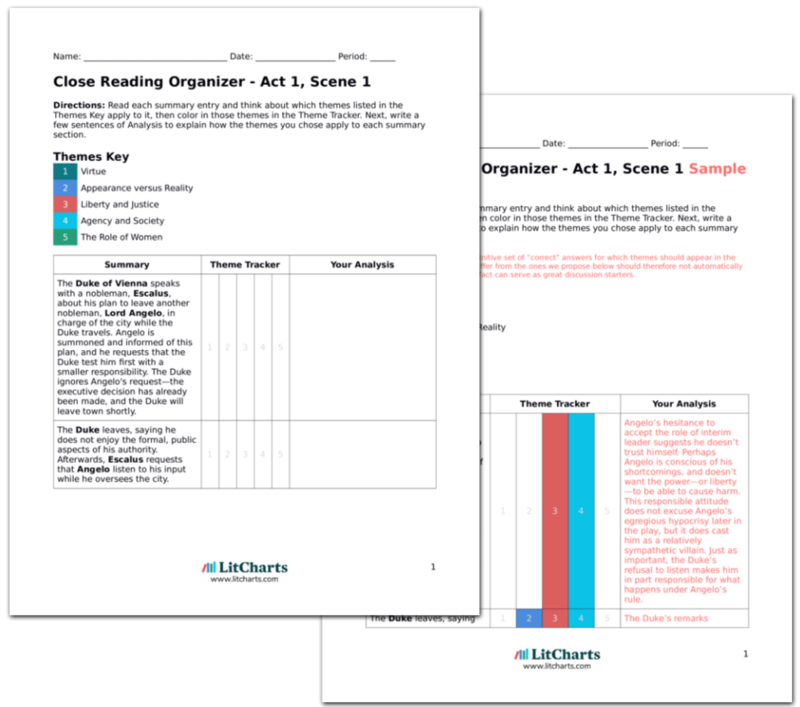 LitCharts assigns a color and icon to each theme in Measure for Measure, which you can use to track the themes throughout the work. Outside town, the undisguised Duke meets with Friar Peter. He gives the friar letters to deliver and asks him to summon several noblemen to the assembly at the gate. After Friar Peter leaves, one of the noblemen arrives, and he and the Duke walk to the city gates. This brief scene does little more than contribute to the suspense surrounding the impending confrontation at the gates. By ensuring that additional noblemen will be there to witness this event, the Duke both sets an example for them and further guarantees that Angelo will be held publicly accountable. Sobel, Ben. "Measure for Measure Act 4, Scene 5." LitCharts. LitCharts LLC, 19 May 2014. Web. 20 Apr 2019. Sobel, Ben. "Measure for Measure Act 4, Scene 5." LitCharts LLC, May 19, 2014. 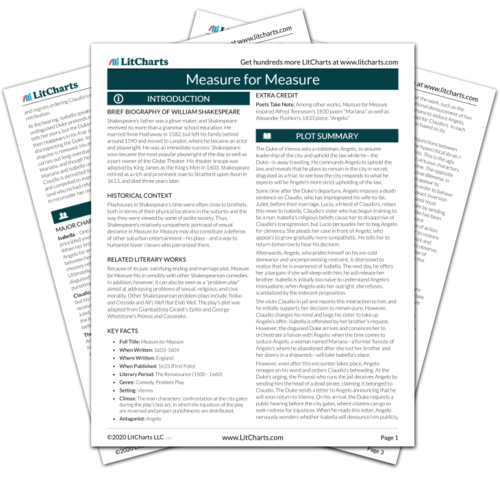 Retrieved April 20, 2019. https://www.litcharts.com/lit/measure-for-measure/act-4-scene-5.